Actually, I am not so interested in forestry, even though it is an important thing to do. I am interested in education, especially from elementary until high school. In Indonesia, we have 12 years for lower grade education – six years for elementary, three years for junior high school, and three years for senior high school. Before I went to the Philippines for my tertianship, I was working in Adhi Luhur High School in Nabire, Papua, Indonesia. Every year, when we receive new students, we still find those who cannot do simple counting and those who cannot read and write easily in our national language, Bahasa Indonesia. Usually, they came from the hinterland, from the mountain area. Why? Because their basic education was not well done. Is this because they do not understand the language, Bahasa Indonesia, or something else? As I looked back, I remember two interviews with the students who graduated from our school. There was a young girl from the Mee tribe. There is some subtribe in Mee tribe that has a different dialect or language. In elementary, in her village, she had to struggle with Bahasa Indonesia. When she moved to another village to continue her study in junior high school, she found it difficult to learn another Papuan language, which was different from her language, plus English as a subject. After she moved to Nabire, to continue her study in our high school, she had to improve her knowledge through Bahasa Indonesia. Another student, named Siprianus Bunay, of Mee tribe, told me that when he was in elementary, in his village, he did not understand Bahasa Indonesia. When his teacher taught Bahasa Indonesia, he just memorized it. After the class, he repeated what he heard. Sometimes he repeated with a loud voice in the forest, where he collected some branches for fuel for cooking. And during the exam, he could answer the questions, but still, did not understand what he had written. From these two examples, I am now thinking about the use of their mother tongue, as a way to explain the subject and not just teach directly from Bahasa Indonesia. Is it true that using their mother tongue will help them? When I heard about APC (Apu Palamguwan Cultural Education Center), I thought suddenly: “Is this the answer?” Maybe. For the last mission in our tertianship, we had to make our elective mission. I chose to go to APC in Bendum, Bukidnon from 2 to 18 February 2011. I had one mission – to know about the use of the mother tongue in an elementary school for indigenous people. From this chart, I knew that the students in APC have to learn at least four languages, which is not easy. In my observation of the classes (from kindergarten until grade 6), I found that when the students had to talk or answer some question, they could speak easily in Pulangiyen. They actually learned something in this way and not just mouthed the lesson in an unfamiliar language. The students have to learn this alphabet from the beginning, in kindergarten. At grade 3, they just started to learn the Roman alphabet. 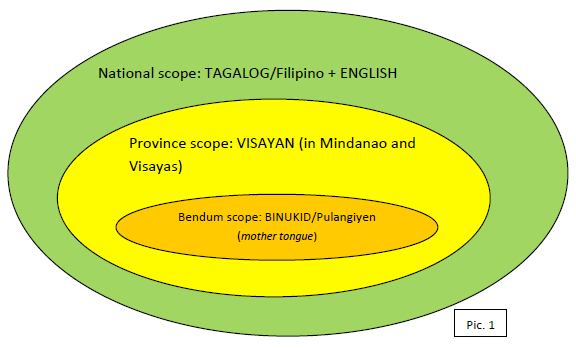 On Picture 1, we see that Visayan is spoken in the Bendum area. Many of the migrants are from the island of Bohol so the children informally learn from their neighbor’s language the other alphabet. When I attended the English class in grade 6, I had another experience. The teacher is a pure Pulangiyen, Cheche Sinhayan. At first, the students had to read the English story. Then the students translated the story to Pulangiyen, sentence by sentence. What happened? Sometimes the student still used the English word because it was more familiar to them. For example, for the word “frog,” when the student wanted to say this word in Pulangiyen, he/she forgot and used the word “frog.” In Pulangiyen, it is bakbak. When this happened, Cheche would stop and ask the student to use the Pulangiyen word. There were two things that surprised me. First, I never liked this in my school, a long time ago, where we had to translate the English word into our national language, Bahasa Indonesia. It was very difficult to translate English into my mother tongue, the Javanese language. I had to think twice, translate it first to Bahasa Indonesia and then to the Javanese language. Second, what Cheche was doing was to be consistent in using a language. The message was, if you use Pulangiyen, please use it purely and do not mix it with another language. Of course, in some cases, there was a difficulty in translating some words to Pulangiyen, for instance in Science subject. Cheche said to me that sometimes, teachers are not also consistent in using Pulangiyen in class; they mix it with another language. Even in their textbook, Magkinanau Kuy (Let’s Learn), which is written in Pulangiyen, the consonant “r” which is not part of the alphabet can be found. Aijen Linantad, 16 years old and a 4th year student in high school, is one of the APC scholars. When I interviewed her, she said that she was proud of her culture. The reason was that she could speak Pulangiyen. But when she entered APC, she knew that it was not enough. She must know the other parts of her culture. In APC, she learned a lot about Pulangiyen culture, like dance, folklore, the structures of the community, the role of the datu (tribal leader), the social system in community etc. When I joined the English class in grade 4, the teacher, Nay Jonah, showed the students a drawing. When she asked the student about this drawing, most of them could easily explain it, with their English. Why? Because the drawing was about their lively culture; it was about the story of their datu doing something, just like in their daily life. From this experience in APC, I noticed that using the MLE method is not just about making a translation into our mother tongue or speaking our mother tongue. Doing MLE means using our culture in our education and being conceptually grounded in it. For the country that has only one culture, with one mother tongue, it is not hard to do this. But for countries that have many languages, many cultures, and many mother tongues such as Indonesia (700 languages), it is not easy to do this. It cannot be done from the top down but rather from the community up. To learn in the mother tongue is to give a strong basis for learning the national language. that culture and no way of belonging to a society.